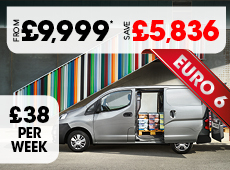 How much is the deposit on a new van? Can you change your mileage allowance on your lease for a van? There are no limits to the mileage you can do on a finance lease deal. We require a £500 deposit to take a van off sale​. Do you have a physical site where we can view the vans you are selling? Or are you just one of these internet only based companies? Are you an actual Dealer for the vans you are selling? Are you a well Established Company? & if so, how long have you been trading? Why do the vans appear to be so much cheaper with Loadsofvans compared to other websites? What's the catch? I've got cash to buy my van outright, but most of my friends seem to lease their vans, what are the benefits of leasing over purchasing the van outright? Contract periods ranging from 24-60 months. The option to continue using the vehicle at the end of your primary lease period. An additional line of finance that may not affect your core banking arrangements. Zero damage or mileage penalties. A final rental, or balloon, payment which can lower monthly rental costs. This can set a value equivalent to a forecast residual value, or can be reduced to take into account potential wear and tear against the resale value. The option to re-finance the balloon payment over a longer time period. VAT registration is not required. The majority of the equity accrued in the vehicle over the length of the lease belongs to you. Can you arrange to sign write my vehicle/am I still able to fit accessories? We know that signwriting on vans can be an important way to market and promote your business and services, and that's why do offer a signwriting service. However, we recommend that you use stickers, as they are easier to remove. We can also arrange for accessories such as roof bars to be fitted. Visit our accessories page to find out more. What happens if I need to settle my Lease early? Whilst it is possible to settle your lease early, we do not recommend it. If you settle your lease early you will have built up less equity in the vehicle than if you continue your lease for the duration. When do new vans need MOT? A new van doesn’t need an MOT for the first three years from its registration date​. Loads of vans always aim to deliver unbeatable priced vans with excellent customer service. Other than your home, a van is in most cases the most expensive item you will purchase in your lifetime. We understand it can be very confusing with all the different makes and models on the market as well as HP, Contract Hire, Leasing, finance lease, flat rates, APR's etc which can make purchasing a van a very stressful experience. With this in mind we have outlined the entire process for you below with examples of documentation which will clarify the procedure for you. Hopefully this will help make purchasing a van a pleasurable experience rather than a stressful one. What Van Do You Want? We have 8 fully trained van sales men and women who are able to help you find the right size/type of vehicle to suit your business requirements. By browsing our website or even talking to one of our dedicated van sales staff we can help you to find the right vehicle for you. Being a multi-franchise and used van centre this is a large range of vehicles to choose from. These details are necessary for our sales staff to offer the best price for your vehicle. On acceptance of the price quoted for your old vehicle we will send you a copy of the 'Condition Report' detailing the information taken from you by the sales person for you to check and countersign. Also a 'Trade In Declaration' which is a legal document to confirm that the information you gave us about the vehicle is correct for the under writing of the vehicle. If you are VAT registered we will also require an invoice for the sale of part exchange to Loads of Vans and the valuation will be subject to VAT @ 20%. We will also require you to send back the signed 'Condition Report', 'Trade In Declaration', your Original V5 (log book) and current MOT Certificate. We have a dedicated Business Manager and finance team that will be able to advise you on all the pro's and con's of each of the options and will help you decide the best package for you. Please click on Finance which will outline the various options available to you. We will fill in a finance application form for you over the phone. Your details will be passed to our network of finance houses who will carry out a credit check on you/your company. If your purchase of a van was subject to finance on approval we would require a £500 deposit. Our FSA regulated Business Manager will contact you to discuss the details and offer you the benefits of certain insurance products available. The finance houses will not accept any form of telephone bills (mobile or land line). The proofs can be emailed, faxed or posted to us but they all must be legible. Our Business Manager will then explain all the finance documentation to make sure you are happy with what you are signing. Once you have purchased your new vehicle you have the option to collect it from our site or we will arrange delivery directly to your door*. On the day of delivery, the sales person that you have been dealing with will contact you to confirm that the vehicle has left the site and is on its way to you. In the unlikely event that your vehicle does arrive damaged, scratched or stone chipped you must contact us as soon as possible. The affected areas must be marked in the corresponding areas on the vehicle delivery note – if damage is not marked on the delivery note we will be unable to address the damage. Repairs will require photographs/estimates for us to proceed with the repair. If all is fine with the vehicle and you are happy with it you will need to sign for the acceptance of the vehicle. If you have agreed a part exchange with us the delivery driver will check that the condition of your old vehicle is to the correct standard from that you had stated and signed for on the 'Condition Report' and drive the part exchange vehicle back to us. Delivery will be charged at £500 for each vehicle.